..Bob Woodward’s new book, Fear, explained… – A Nibble – A Bite – or a Meal! How did Woodward report this book? And which Trump aides talked to him? 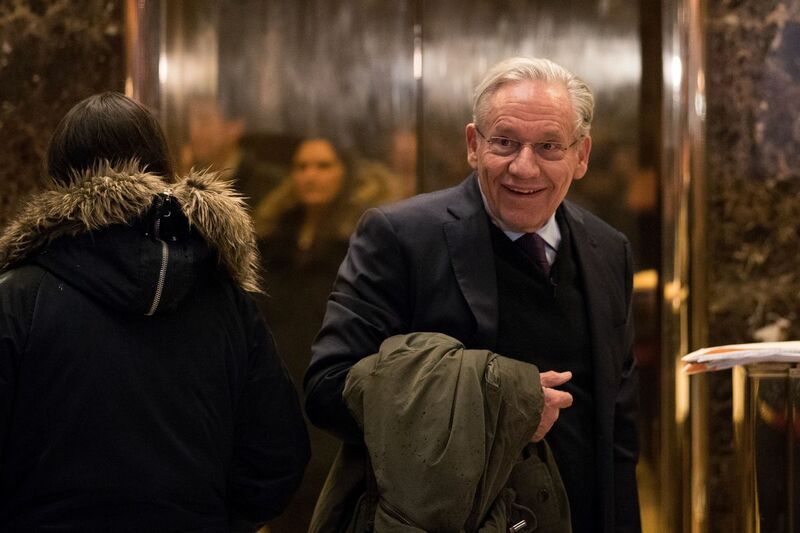 Bob Woodward at Trump Tower in January 2017. The headline revelations from Bob Woodward’s new book, Fear: Trump in the White House, which was released Tuesday, are troubling ones. The book describes disturbing behavior by the president of the United States and claims that many of his aides actively work to counter what they see as his most destructive instructions. But though the book contains many new, never-before-reported details — Woodward reports that Trump wanted to assassinate Syrian President Bashar al-Assad, and considered sending a tweet his aides worried could cause war with North Korea — the book is unmistakably the product of the sources who talked the most to the Washington Post reporter. And those sources have their own agendas. It’s barely a stretch to say Fear reads as Rob Porter, Gary Cohn, Steve Bannon, Reince Priebus, Lindsey Graham, and John Dowd’s account of the Trump administration. Woodward doesn’t explicitly identify any of these six people as his sources, but he provides pages and pages of their thoughts and motivations. So yes, Fear offers insight into a dysfunctional policy process, with new details of President Trump ranting, raving, and clashing with aides behind the scenes. But it also tells the particular story that Woodward’s major sources have chosen to tell him, and reflects their points of view and priorities. The scandal led to Nixon’s resignation; it also made Woodward one of the most famous reporters in the country. Since then, Woodward’s primary aim hasn’t really been to expose deeply hidden scandals (it’s tough to top Watergate, after all). Instead, he’s used his fame and decades of Washington connections to report and write books about what’s going on in the highest levels of the US government. His past political books have covered the Supreme Court, the Federal Reserve, and several previous presidencies. The books have tried to put readers “in the room,” depicting what happens behind closed doors at these institutions. A “background” interview is in the middle of the spectrum ranging from on the record, where a reporter’s source is identified, and off the record, where the information from the source can’t be printed. “Deep background,” however, is even vaguer than that. Essentially, Woodward can use the information he gets from his interviews — but he won’t attribute it at all. Instead, he will just write that it happened in a voice-of-God style, without explaining where it’s coming from. Deep background serves several purposes. Stylistically, it allows for a more readable narrative — because, unlike traditional reported works, Woodward doesn’t have to keep slowing down to attribute his information to sources. The critique here is that also can produce a misleading narrative that reads more authoritatively than it should. The more noble-sounding motivation is that deep background better protects sources’ identities and allows them to speak more freely, by obscuring which information is coming from where, and even how many people it’s coming from. The flip side of this is, of course, that anonymous sources may feel freer to lie or mislead if shielded from accountability. The practice also can shield the reporter from some accountability, as we don’t know whether any particular salacious anecdote is coming from one source or several. Yet one somewhat paradoxical feature of the way Woodward uses deep background is that it’s often quite obvious who appears to have talked to him. That’s because Woodward chooses to write, often at great length, about the supposed “thoughts” and motivations of certain government officials — but not others. Take, for instance, the opening of Chapter 10 of Fear. The pretension to be able to recount the private thoughts of top government officials, months later, based on no attributed source, is a longstanding, somewhat absurd stylistic tic of Woodward’s books. In some ways, though, it could actually be described as transparent. By writing these passages in this way, Woodward is making it extremely obvious that Priebus is a — or the — major source for these passages. Really, how else would he possibly know Priebus’s thoughts? It’s a helpful reminder of where this information — and, probably, other information surrounding it — likely comes from. It’s similarly revealing to keep an eye out for whose thoughts we aren’t privy to. For instance, if you want to know what Jared Kushner “thought” about anything that’s happened in Fear, you will be searching in vain — because, it seems, he didn’t dish to Woodward. Who were Woodward’s sources for Fear? One more longtime feature of these Woodward books is that he’s developed a reputation for portraying people who talked to him extensively much more positively than people who didn’t. The specific question of how many people talked to Woodward is a bit of a red herring. That’s because, often, when a reporter talks to someone, the source won’t give very much of use — they’ll be cagey about details, devote only a limited amount of time, and prove unwilling to divulge much that’s off-message or not already known. Conversely, certain other people can be very helpful indeed. They can take hours and hours of their time to talk, helping Woodward nail down dates and details, and offer up tons of newsworthy or juicy information. For Fear, it certainly seems that a few people dished like this — because Woodward tells most of the book through the eyes of a few individuals, describing their thoughts and motivations at great length. There are likely other sources who are somewhat better disguised — the sourcing of the material about Secretary of Defense James Mattis, for instance, doesn’t seem clear to me — but these are the obvious ones. You will note that all the White House officials listed here have left their positions with Trump, meaning that they have more free time to talk to Woodward and that they’re no longer at risk of being fired for doing so. The other apparent source, Graham, is an elected official in his own right. That’s what you risk if you make the choice not to speak to Woodward — your rivals will get to leak unflattering stuff about you that goes unanswered, and they’ll get to tell their stories while yours remains untold. In Woodward’s defense, it’s rather difficult for him to explain things from Mnuchin’s point of view if Mnuchin doesn’t want to talk to him. Still, the starkness of the contrast does call into question some aspects of the project here — and should remind us that what we are reading is only part of the story. After a few chapters on the final months of the 2016 campaign and the transition, the book chronicles roughly the first 13 months of Trump’s presidency. The main focus is internal administration happenings regarding a sprawling set of subjects, mainly national security and economic policy. North Korea, trade, Afghanistan, Syria, the Mueller investigation, DACA, and the fallout from Trump’s Charlottesville comments are some of the most prominently featured topics. On April 4, 2017, after a sarin gas attack on Syrian rebels was attributed to the Syrian regime, Trump phoned Secretary of Defense Mattis and said he wanted to take out Syrian President Assad. Beyond potential new wars, the closest thing to unifying themes for the book are Trump’s clashes with the economic and foreign policy establishments, some of his aides’ frantic attempts to get him not to disrupt the “global order,” and the disdain and frustration some of those aides have for the president (as revealed in early excerpts). But really, the book is less a thematic project than it is a compilation of accounts from Woodward’s seeming major sources. There are, however, some curious omissions. The travel ban fiasco is one of the defining moments of the Trump administration, and I thought it would have been perfect for the Woodward treatment: a detailed, definitive recounting of what unfolded in those early chaotic days. Instead, Woodward skips the travel ban, including only one glancing reference to it after the fact. Was he uninterested in it? Did he not get enough fresh material? Or was Steve Bannon far less eager to chronicle his role in it than he was to tell Woodward’s audience about his Afghanistan war skepticism? Should we trust the book? Woodward has a reputation for meticulous note-taking and interviewing, combined with recording nearly all of his interviews. I’d certainly expect that everything in the book is something someone told Woodward. But with the way his books are written — and the contrast between the treatment of sources and non-sources — some grains of salt are certainly called for. In my view, Woodward is at his best when he recounts contentious meetings, for which he’s cajoled or intimidated several attendees with different interests into giving their version of what happened, and cross-checked what they’ve said against one another. Things grow less certain when we’re dealing with one source’s recollections of things they saw in private. Take the numerous accounts in the book of Trump saying and doing controversial things in the presence of Rob Porter. I don’t necessarily think Porter would lie about this stuff, but it’s necessarily tougher to verify (unless he documented it somehow), and he certainly has reason to be upset at the Trump administration, given his ouster. And in recounting his own behavior, he certainly will try to make himself look good. Least reliable of all are the frequent third-person accounts of what administration officials are purportedly thinking and what their motivations are. At the very least, you should be fully aware that these accounts likely come from these officials themselves and obviously should not be taken at face value. They’re not necessarily too far removed from spin. In a sense, Fear chronicles the Trump administration largely through the eyes of an accused spousal abuser, the former president of Goldman Sachs, the former head of Breitbart News, and Trump’s former lawyer. So keep that in mind. But also keep in mind that they were in the room — and you weren’t. Previous Post ..A Spy Story: Sergei Skripal Was a Little Fish. He Had a Big Enemy….